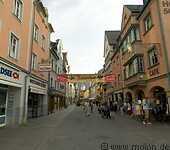 The town of Fuessen (Füssen) lies in southern Bavaria, close to the border with Austria. Every year a large number of tourists visit it due to its convenient location near the alps, the castles Neuschwanstein and Hohenschwangau. Füssen dates back to Roman times, originating as an outpost along the trade route connecting northern Italy and Augsburg. It grew considerably during the Renessaince and has been part of Bavaria since 1803.